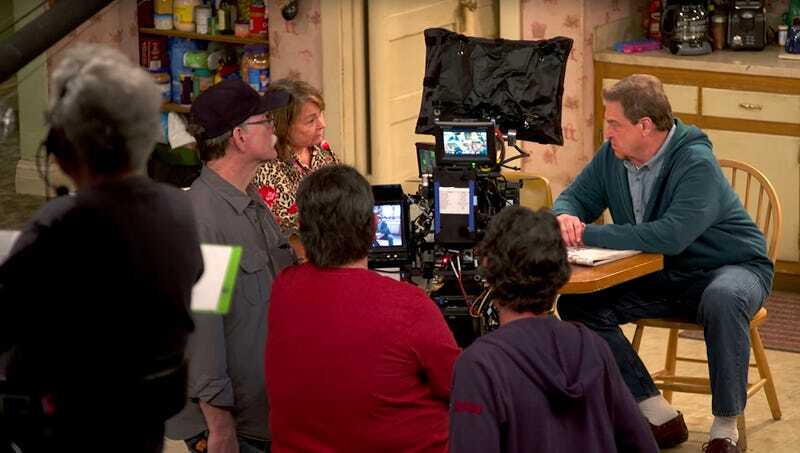 LOS ANGELES—Frustrating the producers who had to keep stopping due to the steady stream of journalists walking on set, sources confirmed that a taping of a Roseanne episode was repeatedly interrupted Wednesday by reporters trying to interview members of the white working class. “We’re forced to call cut every five minutes when another New York Times reporter shows up and asks Roseanne what it’s like to be a member of the white working class who feels left behind and supports President Trump,” said director John Pasquin, adding that they had only gotten through one scene the day before because reporters from the Los Angeles Times and CNN barged in to ask John Goodman about his experience living in “real America” and whether he thinks Trump has done a good job so far. “We were trying to do a scene about the grandson’s problems being bullied at school, and there’s a knock on the door—it’s supposed to be the guy who Darlene’s dating, but it was just another goddamn journalist from the Washington Post who wanted to interview everyone about the role of automation in the decline of the working class. Just this morning, we discovered some guy from PBS embedded in the living room set. If I hear the phrase ‘beaten-down America’ one more time, I’m gonna lose it.” At press time, security was trying to remove a Newsweek reporter who was asking the cast about their experiences living in a district Trump won by 26 percent.